Some years ago Barcelona was a wasteland when it came to traditional Spanish tapas, and especially Basque pintxos. 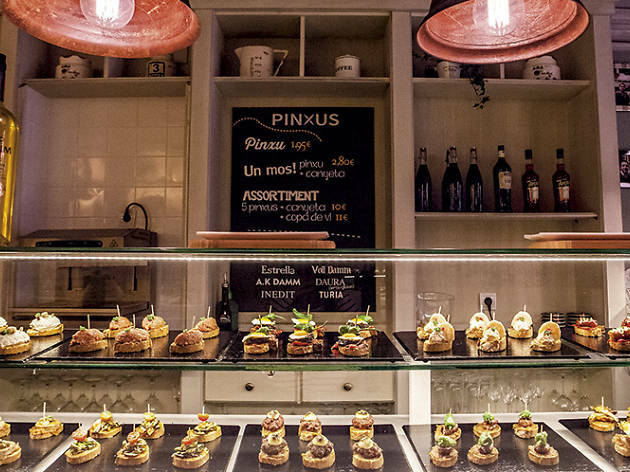 No one could imagine a place like Els Pinxus, where they've got an endless variety of top-class selections of both, as well as beer on tap pulled like the bar staff came straight from some of Madrid's best bars. 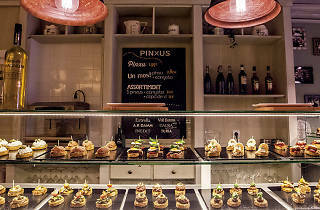 Toni Santanach is in the kitchen at Els Pinxus. Santanach, who was part of the team of chefs at Mey Hofmann's school, wanted to show that it's possible to make Catalan-style tapas and pintxos in Barcelona, using a culinary tradition that, as master chef Toni Massanés showed in his 'Corpus de la cocina catalana', doesn't need to be reflected in any other type of Hispanic or European cooking. His 'fuet' sausage tartare pintxo is an exceptional declaration of principles. Our dinner practically revolved around a few pintxos that featured high-quality bread – fundamental here – although I was able to try a fantastic sepia meatball tapa as well. The meat they use is of the best quality, and I highly recommend the veal burger pintxo with two-mustard mayonnaise. You'll find something for everyone's taste. If, like me, you have a strong predilection for tripe, you'll be happy to know that here it's like the best of a Spanish granny's home-made repertoire. And the scrambled eggs with salted cod is also tops. I also can't go without mentioning the crunchy strips of aubergine, drizzled with aromatic honey – a total vice for anyone with a sweet tooth. The Russian salad is good, though the 'Iberian secret' with brie pintxo might work better with a stronger cheese. And since Santanach studied at Hofmann's school, you know you won't want to skip dessert.